Two days after bones found on Vatican property last week were sent for DNA testing, more remains were uncovered in the same area that are likely to belong to the same individual. Source: Crux. According to Italian agency ANSA, the new remains, found on Tuesday, consist of part of a skull and jawbone. 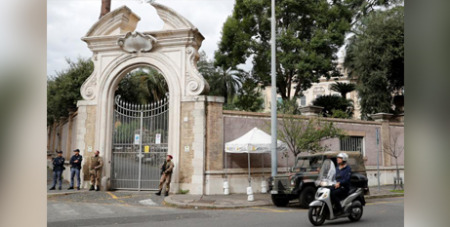 Authorities believe the fragments belong to the same partial-skeleton uncovered last week by workers carrying out restoration on a building attached to the Vatican’s embassy to Italy. Mr Arcudi told Italian newspaper Corriere della Sera that in his view, the skeleton likely belongs to someone between 25-35 years of age - an analysis which, if true, would debunk theories that the remains belong to one of two missing teenagers who disappeared in 1983. For many Italians, the discovery of the bones has reawakened curiosity and speculation over the cold cases of Emanuela Orlandi, whose father worked at the time for the Vatican bank and lived on Vatican property, and Mirella Gregori, who went missing about a month before Ms Orlandi.